Kids of all ages and even adults surely love this character. He has transcended generations and continues to touch hearts all over the world. Guess who we are talking about. It’s Mickey Mouse, of course! He’s one of the many adorable Disney characters that we know. With his distinct and cute physical look, one can’t resist his timeless charm. This character already created is one of the world’s most beloved trademarks. 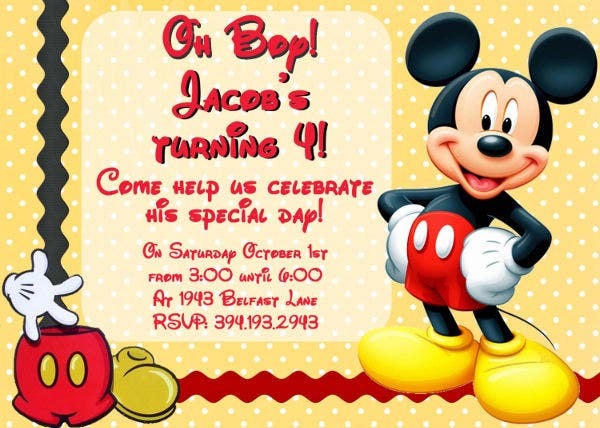 If we combine Mickey Mouse with birthday parties, isn’t that awesome? 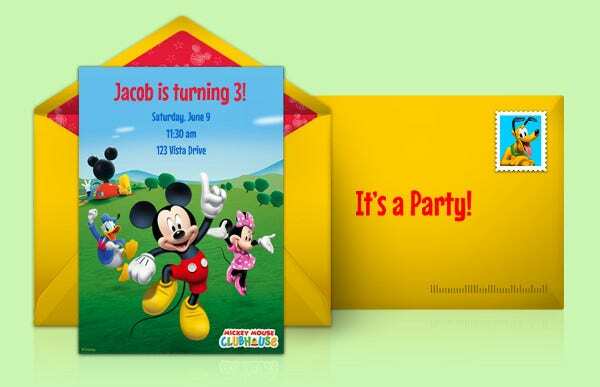 For those who are obsessed with this character, what we did is, we’ve created special birthday invitation templates cards just for you, perfect for a Mickey Mouse–themed birthday party both kids and adults will surely love. Birthday Celebrations Are a Blast! A birthday is a special occasion that needs preparation and planning ahead of time. You need to make sure that everything is ready—from the food, party favors, balloons, etc., everything should be spotless. Some of us are even willing to spend lots of money just to make our birthday, or our children’s birthdays, a one-of-a-kind celebration. This is because a birthday is something we all treasure for the rest of our lives. It always has a special place in our hearts and just by remembering it will make us reminisce of days gone by. Plan ahead of time. This will ensure that by the time of the party, you already have everything you need. Do not make last-minute plans as this can mess up your celebration. 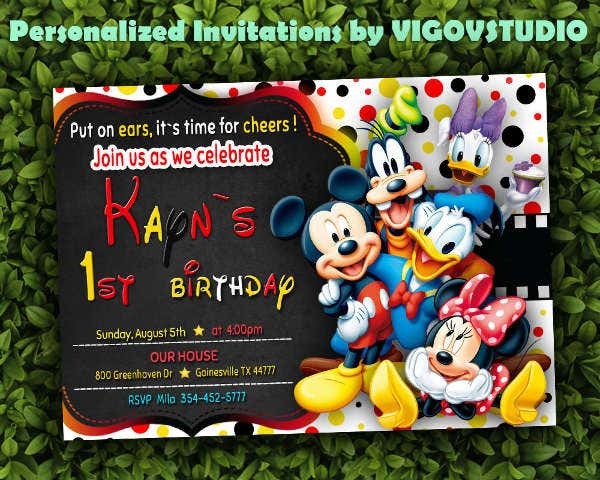 Invite limited guests. Combining limited food and tons of guests is a disaster. Make a list of those people you would like to invite. Limit them to immediate family and a close circle of friends. Pick a theme. It is always great to have a themed birthday party. It adds up to the fun and adds color to the event. Plan a good music. Without this, a party may become less lively. Add festive music that matches the hype or the theme of the party to boost up your guests’ mood. Make sure everything is well presented. This also plays a very important role in a party. Guests tend to judge how the party is presented from the props down to the food. 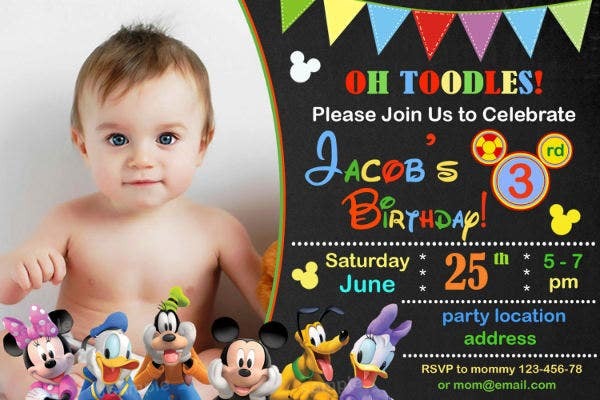 Our website also offers a host of Mickey Mouse birthday invitation templates for more designs, if you haven’t found the perfect card design for your little guy or girl in this article. Regardless what type of celebration it is, whether a wedding, graduation, or birthday, there should always be an invitation card. 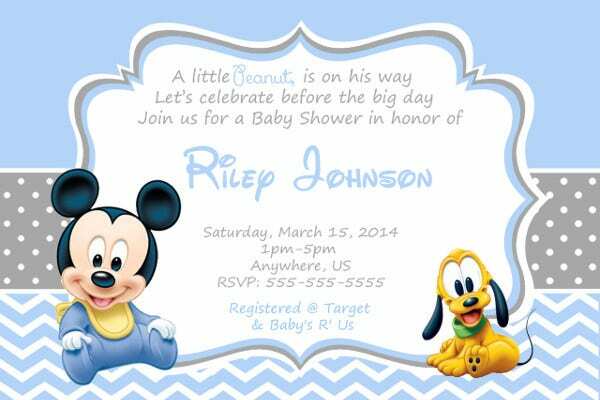 We’ve gathered all the best, beautiful, and cute Mickey Mouse invitation card designs the web has to offer. 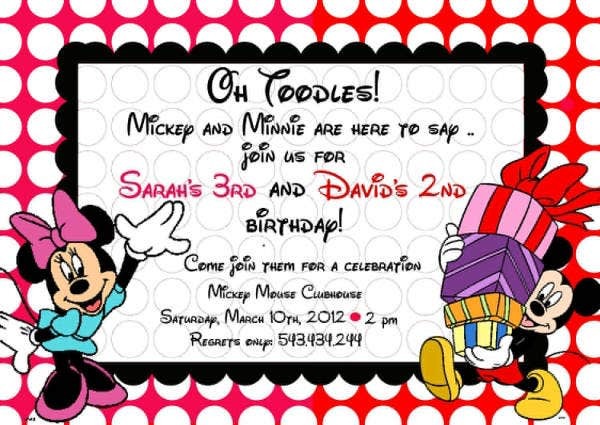 There are a total of 9 designs to choose from, perfect for your Mickey Mouse–themed birthday party. Each template is available to download for free, or you could license them for a nominal amount. 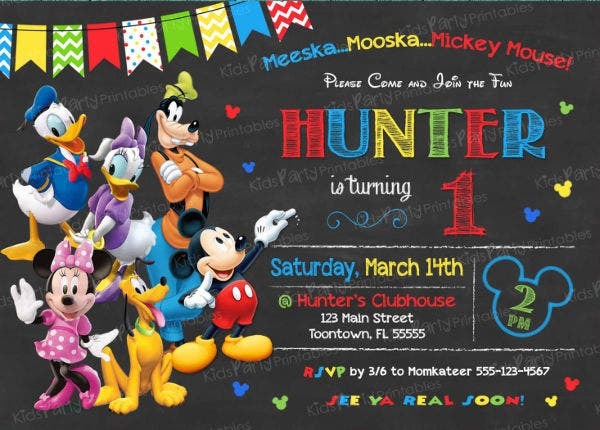 The Mickey Mouse templates all come in PSD, AI, Vector, or EPS formats, which means editing them in your preferred illustrator software is a breeze; and they all come up with very cute and colorful font styles. 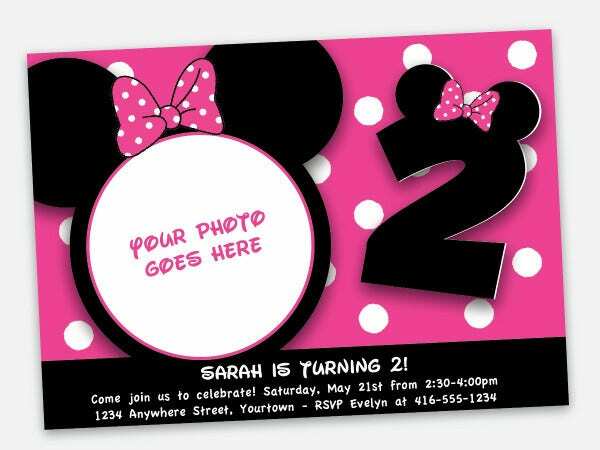 For more specific invites for your little girl’s big day, check out our collection of Minnie Mouse invitation templates perfect for girls of all ages. 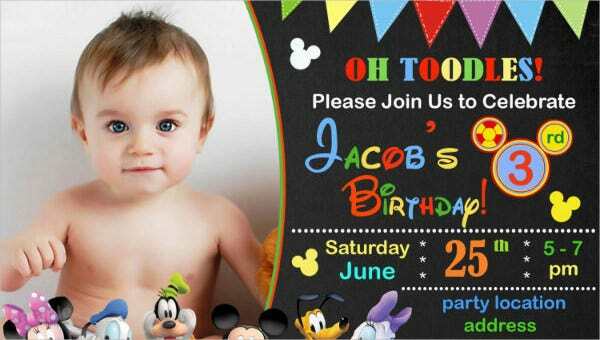 We hope with the tips and templates our website has provided, it lessens your burden in preparing the perfect birthday party. Enjoy and have fun!